For an isolated molecule, the total energy can be approximated as a sum of terms involving translational, rotational, vibrational and electronic states, and this is a good approximation for the large majority of systems. For linear, "floppy" (soft bending potential) molecules the separation of the rotational and vibrational modes may be problematic. If two energy surfaces come close together (avoided crossing), the separability of the electronic and vibrational modes may be a poor approximation (breakdown of the Born-Oppenheimer approximation, Section 3.1). There are in principle also energy levels associated with nuclear spins. In the absence of an external magnetic field, these are degenerate and consequently contribute a constant term to the partition function. As nuclear spins do not change during chemical reactions, we will ignore this contribution. The assumption that the energy can be written as a sum of terms implies that the partition function can be written as a product of terms. As the enthalpy and entropy contributions involve taking the logarithm of q, the product of q's thus transforms into sums of enthalpy and entropy contributions. For each of the partition functions the sum over allowed quantum states runs to infinity. However, since the energies become larger, the partition functions are finite. Let us examine each of the q factors in a little more detail. The translational degrees of freedom can be exactly separated from the other 3N - 3 coordinates. 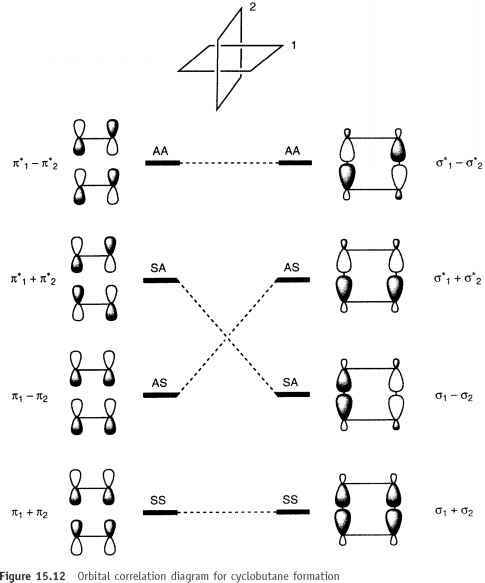 The allowed quantum states for the translational energy are determined by placing the molecule in a "box", i.e. the potential is zero inside the box but infinite outside. The only purpose of the box is to allow normalization of the translational wave function, i.e. the exact size is not important. The solutions to the Schrodinger equation for such a "particle in a box" are standing waves, cosine and sine functions. The energy levels are associated with a quantum number n, and depend only on the total molecular mass M.
Although the energy levels are quantized, the energy difference between levels is so small that the distribution can be treated as continuous. The summation involved in the partition function can therefore be replaced by an integral (an integral is just a sum in the limit of infinitely small contributions). Inserting the energy expression and performing the integration gives eq. (13.22). The only molecular parameter that enters is the total molecular mass M. The volume depends on the number of particles. It is customary to work on a molar scale, in which case V is the volume of 1 mol of (ideal) gas. In the lowest approximation, the rotation of a molecule is assumed to occur with a geometry that is independent of the rotational and vibrational quantum numbers. A more refined treatment allows the geometry to "stretch" with rotational energy, which may be described by adding a "centrifugal" correction, and such corrections are typically of the order of a few percent. The presence of vibrational anharmonicity will furthermore cause the effective geometry to depend on the vibrational quantum state. Within the rigid-rotor approximation these effects are neglected, i.e. the rotation of the molecule is assumed to occur with a fixed geometry. The energy levels calculated from the Schrodinger equation for a diatomic "rigid rotor" are given in terms of a quantum number J running from zero to infinity, and the moment of inertia I. The moment of inertia is calculated from the atomic masses m1 and m2 and the distances r1 and r2 of the nuclei relative to the centre of mass. For all molecules, except very light species such as H2 and LiH, the moment of inertia is so large that the spacing between the rotational energy levels is much smaller than kT at ambient temperatures. As for qtrans, this means that the summation in eq. (13.10) can be replaced by an integral.